The Vince J. Whibbs, Sr. Community Maritime Park is a multi-use, public-private park development on Pensacola’s waterfront. Located in Historic Downtown Pensacola, this park features beautiful views of Pensacola Bay, over 38,000 square feet of outdoor event space, an amphitheater, playground, and festival grounds. Visitors can enjoy beautiful sunrises and sunsets, fishing, and watch boats and vessels of all sizes and types as they travel along the waterfront. Community Maritime Park is named for Pensacola Mayor Emeritus Vince Whibbs Sr. who served seven consecutive terms as mayor from 1977 to 1991, making him the longest serving Mayor in Pensacola’s history. Mayor Whibbs was known for his commitment to public service and to the community. The Community Maritime Park is home to the Pensacola Blue Wahoos baseball team, the AA affiliate of the Cincinnati Reds, and were the 2017 southern League Champions. Blue Wahoos Stadium is considered one of the most premier facilities in Minor League Baseball and was named 2012 Ballpark of the Year by Baseballparks.com. The City of Pensacola hosts the Blues Angel Music Blues on the Bay summer concert series, the 5-2-1-0 Northwest Florida Day of Play, and the Hill-Kelly Movies in the Park series here. 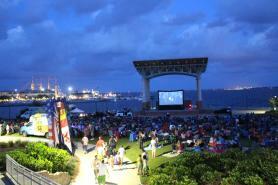 Some of Pensacola’s largest outdoor events and festivals are held at Community Maritime Park, including the Smokin’ in the Square barbecue competition, Burger Battle By the Bay, Symphony Sparks and Stars, the Gulf Coast Summerfest Jazz Edition, Barktoberfest, as well as many runs, marathons and charity walking events.